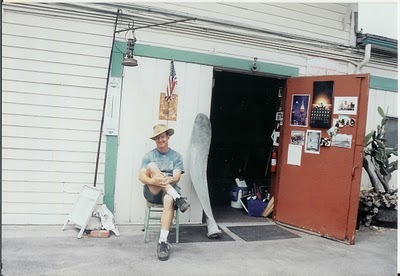 This is an old photo of me in front of my Studio in Santa Barbra, in the Old International Dairy. Built in the late 1800's the Cattle would graze all day up on the Mesa, then be brought down to this Dairy to be milked. Chad's restaurant was the farm house for the Dairy. In 1944, a B-24 Liberator went missing near Santa Barbara. (It had crashed up in the mountains near Santa Ynez). A second B-24, with full crew, was sent up as a search plane. It too disappeared, not to be heard from again. Decades later a wreck site was discovered in the ocean off Santa Rosa Island. It turns out that this was the wreckage of the search plane. There was a crash report filed and what was deduced was this second plane (the search plane) was in low clouds off Santa Rosa Island, when it hit the steep cliff on the south side of the island, and disintegrated. Aside from the engines found by divers, this propeller is one of the archaeological remains from the crash site. I was borrowing it from the Santa Cruz Island foundation,(who exhibit it as a lawn ornament) to take down and display at the Commemorative Air Force Museum, in Camarillo CA. It was there for a few months, next to the painted star on a aluminum skin off the wreckage of the original B-24 this plane was sent out to find. Strange timing; fate and tragedy through and through.